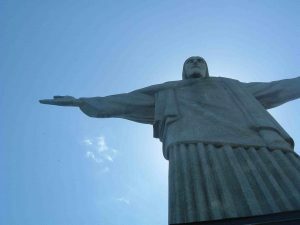 RIO DE JANEIRO – After fifteen days of less than glorious isolation during which time he became the victim of vandalism and remained under the cover of substantial scaffolding, Cristo Redentor (Christ the Redeemer) ‘reopened’ on Sunday to a limited number of visitors. It will be more than a month until Cristo Redentor is returned to his former glory, provisionally scheduled for June, photo by Doug Gray. Week-long heavy rains that began on April 5th and the ensuing landslides blocked the access road to the top of Corcovado to all traffic. The tram from Cosme Velho – the most popular means of access – was also declared a danger to public safety and shut down pending ongoing investigation and stabilization of the track. The tram remained closed this week, while the road was reopened to a limited number of licensed taxis and tourist vans. Private cars are still not allowed to make the journey up the hill to the monument. For thousands of tourists visiting Rio over the Easter holiday period, one of the most photogenic of all the city’s attractions was off limits to the snapping hoards. That did not stop many making the trip up before the storms of early April for the magnificent view afforded from the vantage points, but the usual flock of tourist helicopters buzzing around the summit has been notable by its absence. When asked about the impact on their business, however, operator Helisight said that in fact the statue itself, while an important focal point, is also popular simply for being one of the highest points in the city. “Its covering up is of course a big deal, but the closure of the park due to the recent rains has in fact seen an increase in our business if anything”, a spokesperson explained. However Cristo, voted one of the seven modern wonders of the world in 2007 and one of the city’s biggest tourist attractions, draws around a third of a million visitors every year, mostly by tram. It remained closed for the duration of the Easter holiday period this year though, resulting in a major loss of revenue for the operators who had already been hit somewhat by the monument’s draping in scaffold. The ongoing restoration work is part of a R$7 million project funded by Vale to guarantee the safety and use of the monument over the next five years. Heavy rains and lightening strikes over recent years also led to the necessity of restoration, and the opportunity has been taken to introduce some new technology to proceedings. Cameras are planned to enable religious ceremonies held atop Corcovado at the foot of the statue to be beamed directly to churches and cathedrals in the city. At the same time new interactive panels will be introduced to enhance the experience of visitors. Earlier this month vandals took advantage of the new found accessibility to the actual body of the statue, climbing the scaffold to spray messages on Cristo’s head and arms. After a concerted campaign, police have reported that the suspects have been found and a 24 year old and a 28 year old have confessed to the crime. The paint has now been cleaned off and the scaffold is expected to be taken down some time in June. it would seem that by the time you are 24 and 28 you would have matured past the need to distroy in the name of fun. this is something i could see high school seniors pushing each other to do. I am glad to hear that this worldwide symbol of Rio is being cared for.